innovative platforms embracing cultural diversity. Sunday, Children's Day is recommended for families as the smaller crowds and kid-friendly floats create a fun vibe. Travel to and from Notting Hill on Carnival weekend will be restricted and heavily congested, so work out your best route by using the journey planner below. It happens every year. London sets aside the Sunday and Monday encompassing their 'bank holiday' on Monday for one of the world's largest street carnivals; Notting Hill Carnival. Each year, close to one million people attend this two-day celebration of Caribbean heritage on the streets of Notting Hill. Celebrations include costume-clad Caribbean's dancing to traditional reggae, meringue, calypso, rumba, and zouk music, and street vendors selling foods like seasoned jerk chicken, callaloo, and traditional goat stew. Many Caribbean foods have roots from cuisines of Europe, America, China, and Africa. The Caribbean is a favorite vacation destination and comprises many islands that are all part of a huge archipelago in the Caribbean Sea. These tropical, beautiful islands were the contention of many European countries who each wanted ownership of a part of this gorgeous region. The English acquired St. Kiss, Barbados, Antigua, and other islands in the 17th century. It's common for many peoples of the Caribbean islands to reside in England. The first mention of a Caribbean celebration was in 1959 when a carnival was held at St. Pancras Town Hall in London to settle down the race relations between indigenous British residents and Caribbean natives. Trinidadian, Claudia Jones, is known as "the mother of the Notting Hill Carnival" for her promotion of this first carnival in The West Indian Gazette, a black motif newspaper. As the editor of the newspaper, Jones featured the fantastical performances of the Mighty Terror singing the calypso and a Caribbean Carnival Queen beauty contest. That first event in 1959 spurred on the yearly carnival that includes a large parade with speakers lining its route sharing Caribbean history, colorful and vivid representations of Caribbean traditions, and countless displays of the Technicolor wares of this island nation. Revelry includes parties, foods, and tropical drinks, many centering on favorite ingredients like rum. This annual celebration in held in the Royal Borough of Kensington and Chelsea is organized and managed by the people of British West Indian communities and it is a significant happening for the Black British culture in London. Close to one million people attend this extravaganza of Caribbean culture and in 2006, the United Kingdom voted to add the Notting Hill Carnival to the famous list of icons of England. This year's Notting Hill Carnival will take place on August 25th, 26th and 27th with Saturday, August 25th being a Panorama; a steel band music competition complete with street food and dancing held at Emslie Horniman’s Pleasance Park from 6:00 to 10:00 pm. Sunday, August 26th will start early, at 6:00 am, with a traditional carnival opening performed in the Caribbean Islands called J'Ouvert. This events main attraction is a parade starting and ending on Canal Way in Ladbroke Grove W10 comprised of revelers donned with mug and brightly colored paints. A Children's Parade will stroll through the streets during the day and at night as children dance and perform in ornate costumes, swirling the brilliant-colored clothing. Sunday is the best day for families with young children with smaller crowds of people and plenty of kid-inspired floats in the parade. All day and into the night Sunday you can catch live music on stages in Emslie Horniman’s Pleasance Park and Powis Square and sample incredible foods from vendors while listening to all kinds of Caribbean inspired music from 38 static sound systems. As always, the Grand Finale will be on Monday, August 27th with a culmination of dancing, street performances, steel drum music groups, and the Notting Hill Grand Finale Parade. All along the route you’ll find scrumptious treats, foods, drinks, and plenty of entertainment. To enjoy this carnival, plan on wearing comfortable shoes as you will do a lot of walking through the festive streets. Closed flat shoes are the best. By the end of each day, the streets will be strewn with party affects and empty containers. 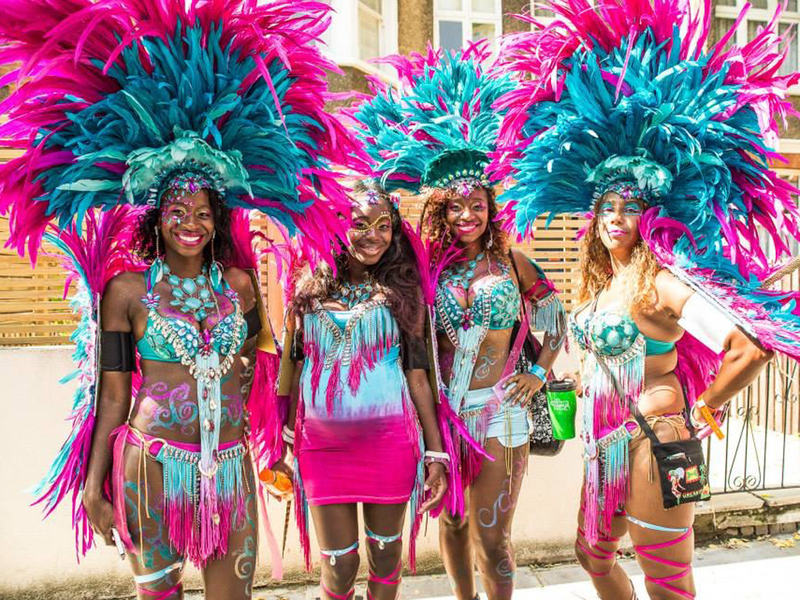 Attendees are encouraged to wear accessories to show their support and love for the Notting Hill Carnival like whistles, crazy styled hats, large jewelry, and whatever suites your fancy. After Carnival you may come back home with a dirty carpet. Using a great vacuum for thick carpet can resolve your issue. Pack a few items in your bag or backpack for the day; tissues, hand sanitizer, wet-wipes, bottles of water, sun screen, sun glasses, and a carnival map so you can make your way around without running into barricaded roads. And if you aren’t exhausted by Monday night and your feet aren’t throbbing, there will be many after-parties in Kensington and Chelsea and other areas in London. Notting Hill Carnival is free! You don’t have to buy tickets or pay to get in. Enjoy all this world- renowned and famous street carnival has to offer! www.thelondonnottinghillcarnival.com is a participant in the Amazon Services LLC Associates Program, an affiliate advertising program designed to provide a means for sites to earn advertising fees by advertising and linking to Amazon.com. As an Amazon Associate we earn from qualifying purchases. Additionally, www.thelondonnottinghillcarnival.com participates in various other affiliate programs, and we sometimes get a commission through purchases made through our links. Amazon and the Amazon logo are trademarks of Amazon.com, Inc., or its affiliates. We do not specifically market to children under 13.